Enfamama A+ contains Brainergy Complex - a unique blend of DHA and other essential nutrients which have been scientifically demonstrated to support healthy pregnancy and lactation as well as fetal brain development. Enfamama A+ has enhanced levelof DHA designed to provide 100 mg per day to help meet the expert recom- mendation for daily DHA intake. High source of Zinc for the development and functioning of the central nervous system. Source of Iodine for normal function of thyroid hormones. Enhanced level of Iron to support the formation of red blood cells in pregnant women. 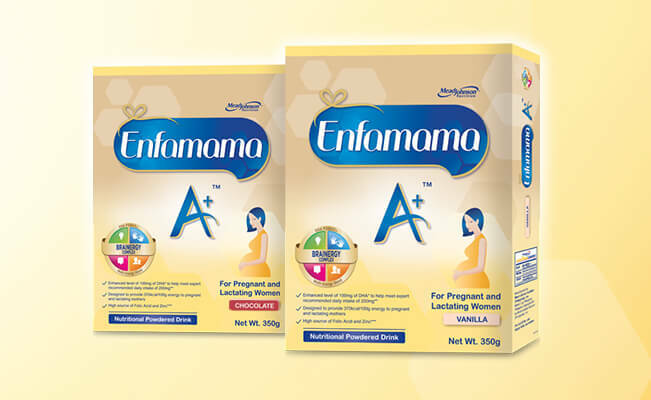 Dissolve 50g powder of Enfamama A+ Vanilla (approximately 4 heaping tablespoons) into 200ml of warm water. Ready to serve chilled or warm.